By Karrar Haider in Gadgets. Updated on November 29, 2018 . Like most other smartphones today, Google Pixel 2 also follows the same trend of sleek and fragile body. If you got yourself the latest Pixel phone, you’d probably be looking to get a protective case for it. Whether you want a clear case, minimal, sturdy, knitted or even a wooden one, I got you covered. Below are the 20 of the best cases for Google Pixel 2 and Pixel 2 XL. Google has teamed up to create a Google Earth-inspired case for the Pixel 2, you’ll need the Live Case app with this case to make it truly shine. The case comes in multiple designs picked directly from beautiful landscapes from Google Earth. And with the Live Case app, those beautiful landscapes will also become your phone’s wallpaper giving a matching look. The Google Earth Live Case is not behind in terms of protection. It has a dual-layer construction with polycarbonate inner and smooth TPU outer body. The case also allows you to use the squeeze mechanism of Pixel 2 to access the Google Assistant. Although it has precise cutouts for ports, camera, and the fingerprint sensor, but I noticed there is no protection to the bulged out camera. You can get Google Earth Live Case right from Google Store for 50 USD. 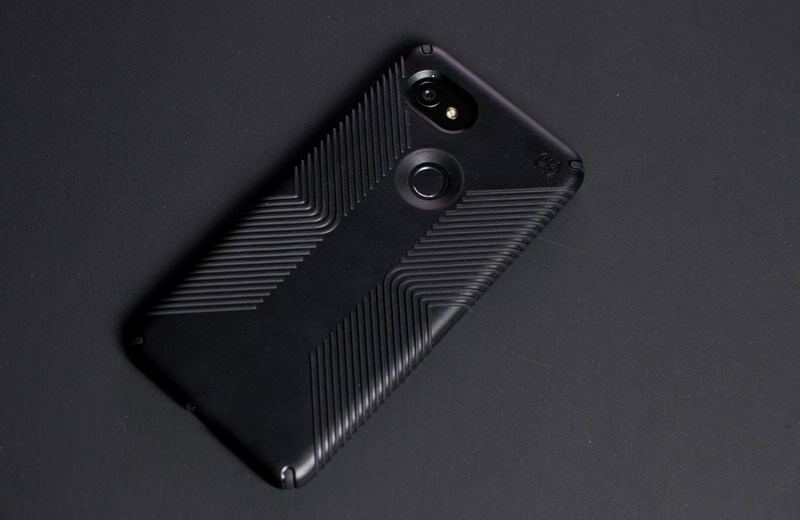 As the name suggests, this Google Pixel 2 case is really tough, but at the same time is really minimal. For a case focused on durability, Spigen Tough Armor is really slim and sleek and hardly adds any weight or thickness to your phone. It’s made from dual-layer Polycarbonate and TPU material to withstand regular drops. Additionally, the cutouts and front corners are also raised to prevent direct impact on the screen or camera. You’ll also love its dedicated buttons that offer tactile feedback and protects the original buttons of your Pixel 2. As an added incentive, The case also has a built-in kickstand for hands-free viewing. Spigen Tough Armor is available on Amazon in both Gunmetal and Black colors. LK Ultra offers a great combination of convenience, style, and protection. The case is made from clear and flexible TPU material that is hardly noticeable on your Pixel 2. The phone is fully viewable and its thin design makes you feel like the case isn’t even there. The outer TPU material is anti-slip and smooth to touch, you’ll surely have a firm grip without facing any resistance while sliding in the pocket. I am sure you can guess that the case is not made for extreme protection, but thanks to TPU build it is actually capable of absorbing most regular drops of 3-5 ft height. LK Ultra Clear case is available in 3 more colors. I’d say it’s a solid purchase. Moment has done an amazing job of offering protection and class in a single case. It has a sturdy TPU and PC outer shell with soft microfiber inner sheet. The case comes with two styles of backplates, wooden and PU leather. The selling point of the Moment Photo Case is the detachable wide lens that helps you take 2x wider photos, perfect for landscape and family photos. Overall, it’s a great protection case that avid smartphone photographers will surely love. 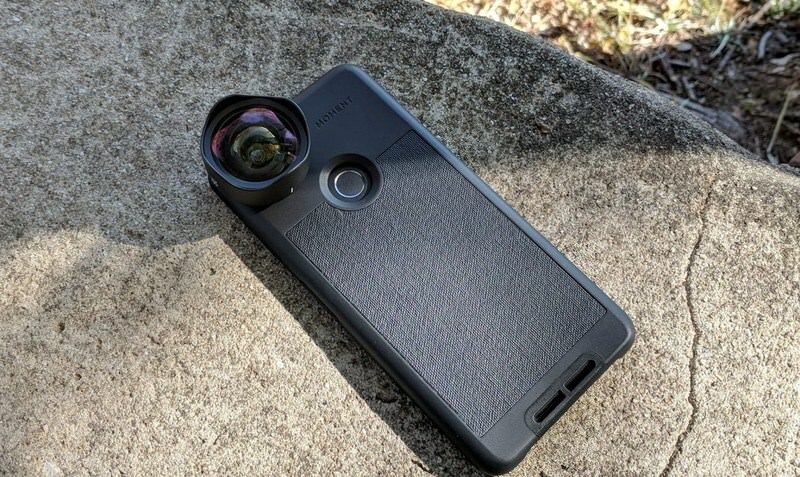 Moment Photo Case doesn’t come cheap, the case along with the wide lens will cost you 129.99 USD and you can buy it from the official Google Store. If you are one of those peeps who are flattered by the beauty of the case rather than protection, then this Fabric case will surely please you. 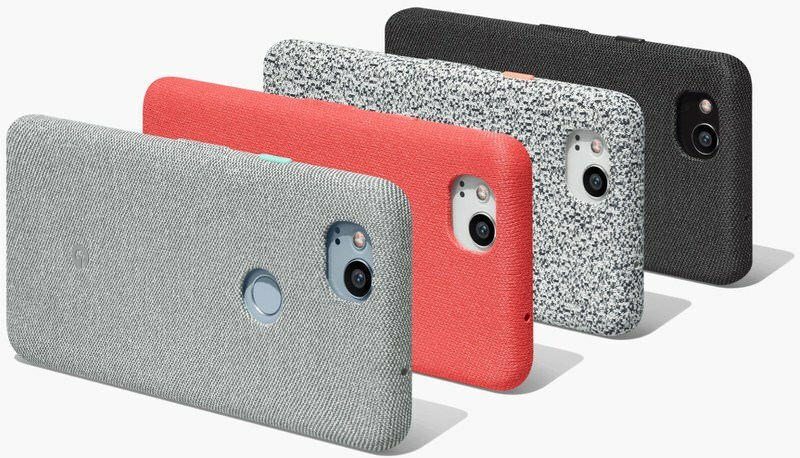 The case has a knit exterior with a combination of polyester and nylon that adds an exquisite look to your Google Pixel 2. Having knitted shell, it offers amazing grip and a unique feel when you’ll grab it. As for protection, it has polycarbonate inner finishing that should resist against regular drops. However, I am not going to recommend it to you if you are an adventure-loving daredevil. Additionally, the outer case can be easily stained, but the case is hand washable. You can buy this beautiful case for 40 USD from Google Store and there are 4 different designs to please you. Carved offers a big collection of wooden cases for smartphones and they have a wide range of collection for Google Pixel 2 as well. All the cases made by them are hand-made and of real material. This case has a beautiful rainbow wolf design, and you can find many other designs on the Carved website. Thanks to different grain patterns of the food, no two designs are same. Each design reacts different to lightening conditions and that’s what makes it beautiful. As for protection, it’s made of wood so it’s definitely sturdy, but not as flexible or resistant to breakage as TPU or polycarbonate. 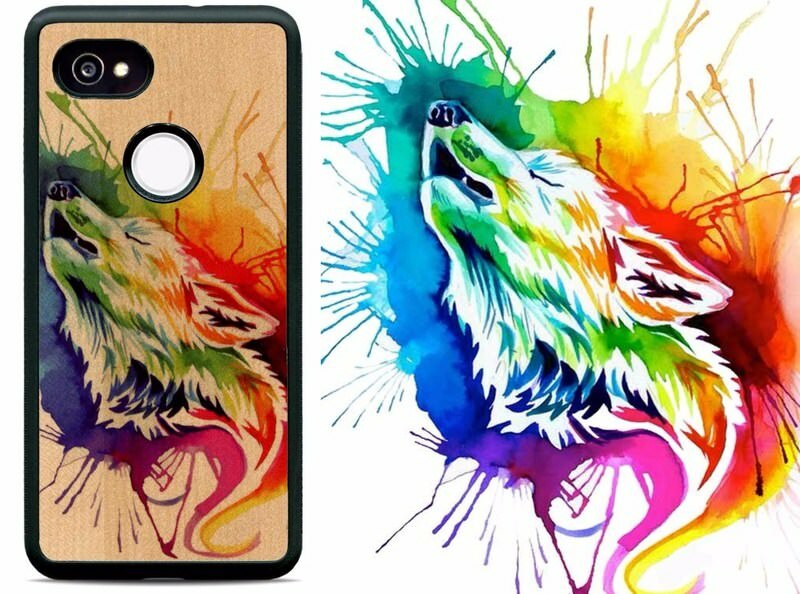 You can buy this Rainbow Burst Wolf design case for 39 USD from Carved, but prices vary by design. 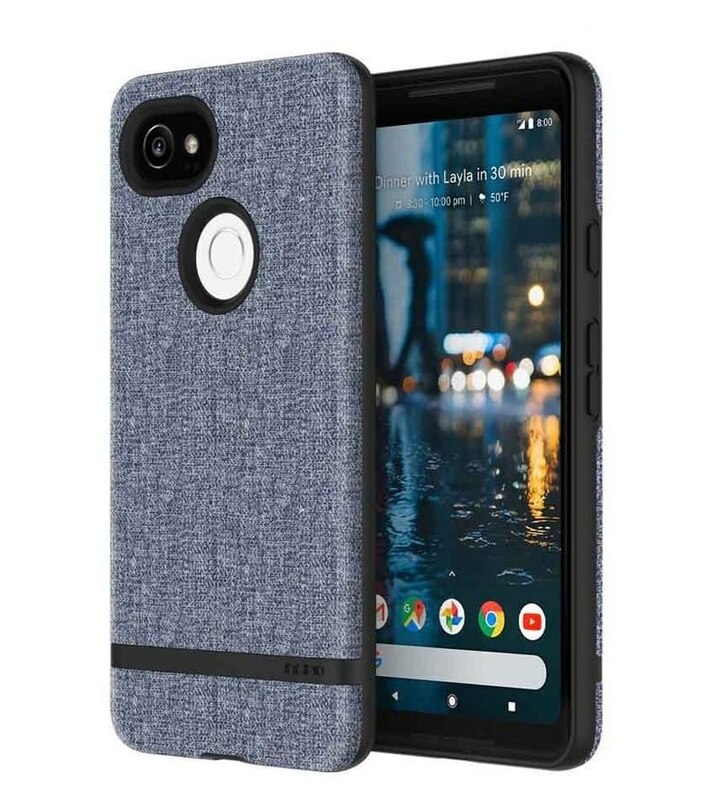 A low profile Google Pixel 2 case that is quite cheap but offers great protection. The case is extremely slim with a fully polycarbonate body. 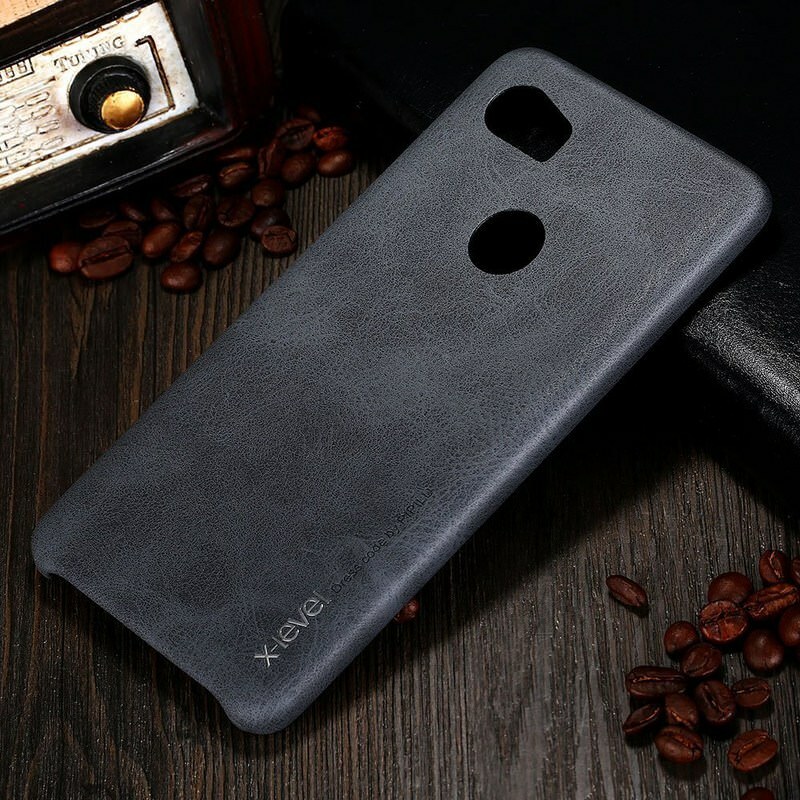 Unlike others in this list, the case has matte finishing which prevents dust and fingerprints while giving a smooth feeling. 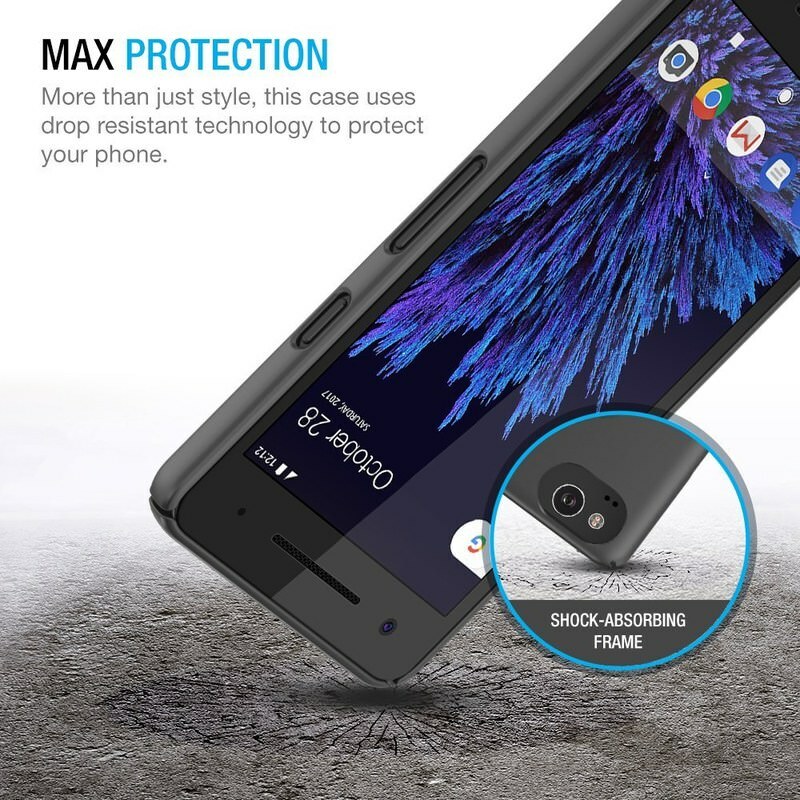 Though it offers great protection, but I noticed its corner are not raised enough to offer any protection to the screen. On top of that, some customers also complained about it being too slippery to grip properly. Just because it’s a leather case doesn’t mean it offers any less protection. Bellroy Leather Case is reinforced using durable flex polymer and soft microfiber lining to cushion the phone. With a minimal premium leather cover available in 4 beautiful colors, your Pixel 2 will surely stand out. As it’s a leather case, it will definitely offer reliable grip and minimize drops. However, I am not sure how much resistance it may create while sliding it in the pocket. Rest assured, it’s a beautiful Google Pixel 2 case that will definitely protect your phone from daily wear and tear. You can buy Bellroy Leather Case for 45 USD from Google Store. This case is created with a goal to prevent drops in the first place. There are rubber texture lines on both sides of the phone that prevents it from slipping. There are also rubbers in the corners of the case to make it easy to take it out of your pocket and resist against drops. The case itself is very slim and adds minimum thickness to the phone. In case you do manage to drop it, its sturdy TPU and PC build will surely be able to save your phone. It also has raised front and cutouts to prevent direct impact to the screen and camera. To top it off, Speck also adds Lifetime Warranty and unconditional 30-day guarantee. You can buy Speck Presidio Grip case directly from Speck for 39.95 USD. It’s also available in 4 different colors at the same price. At an affordable price, Trianium Clarium Case packs in great protection and style. With a compact TPU build, the case offers reliable protection against drops and makes it easy to carry the phone. The back of the phone is fully transparent to retain the original color of your Google Pixel 2 and offers the same protection. Interestingly, the case has 4 tiny raised bezels in the back that prevent it from touching the ground in the first place, therefore there is a lesser chance of scratches and smudges. These bezels also protect the camera from touching the surface. Additionally, the raised front protects the phone’s screen. You can buy this stylish protective case directly from Amazon. 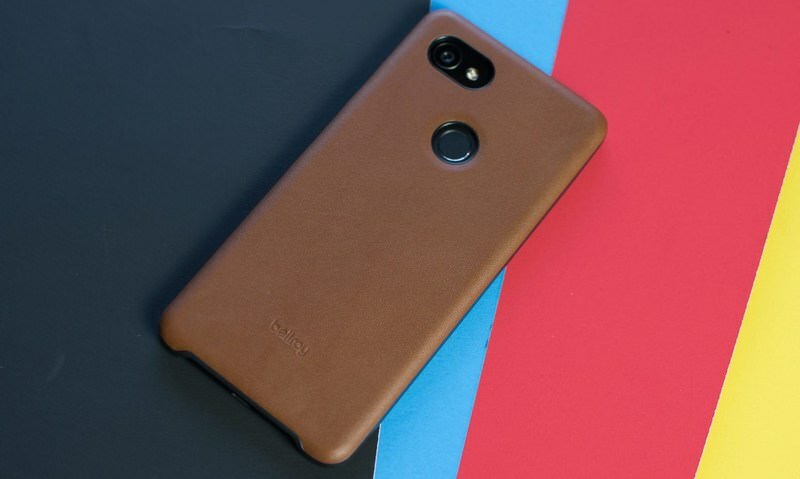 This case by Caseology has three different 3D textures that add a great look and also help grip the bigger Pixel 2 XL firmly. It’s made of TPU material and there are dedicated inner cushions in the corner of the case offering reliable protection from drops. Similar to most other cases, the front lip of the case is slightly raised to prevent the screen from touching the surface. Although it is only available in black color, its textures and overall slim design should please most people. Incipio has done a great job of offering a case with fabric finish that still offers great protection. This case has a sturdy TPU build that ensures it could easily resist against drops and bumps. And that TPU body is covered by a beautifully soft cotton fabric that gives it an amazing look. As it has a fabric finish, it offers reliable grip and overall great feel while holding. Furthermore, the case fully covers the buttons and has raised front lips to prevent damage to the screen and buttons. Incipio Carnaby is available in blue and gray colors and you can buy it directly from Amazon. 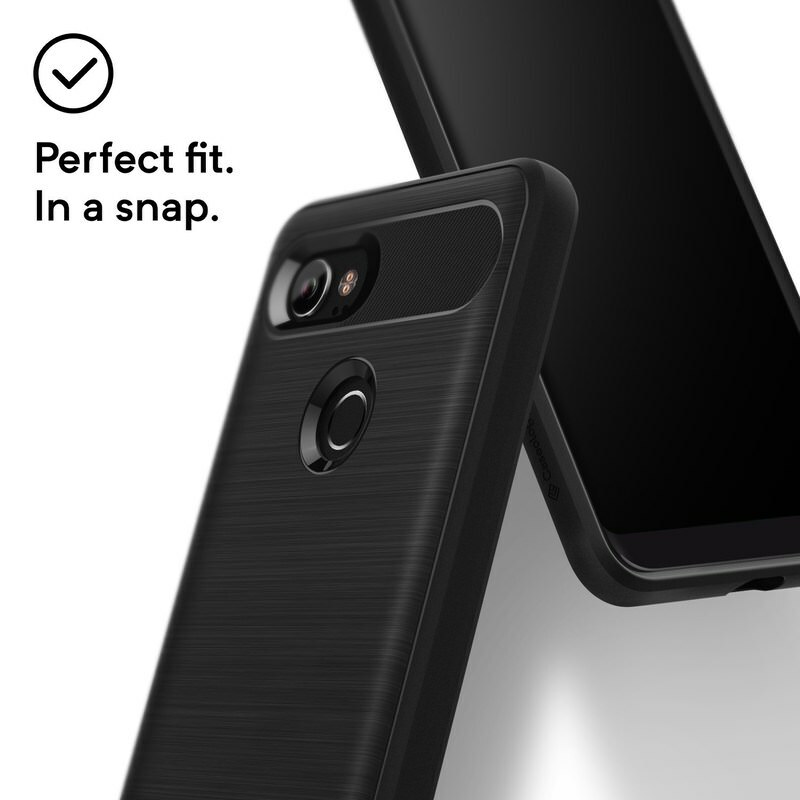 One of the most minimal cases you can find in the market, Spigen Thin Fit is extremely slim and lightweight Google Pixel 2 XL case. It has a polycarbonate body with matte-finish that offers reliable resistance and a sleek look. Thanks to matte-finishing, the case also offers good grip and friendly pocket experience. Unlike most other cases, the Spigen Thin Fit case has open buttons that allow you to use the original buttons of your Google Pixel 2 XL. Although this offers original click response, but this also means that buttons are open to dust and daily wear and tear. To be honest, I am really not sure why this case is available for so cheap when it offers so much. It’s a wallet case that adds good overall protection while offering tons of space to slip in cards and money. The case has three slots for cards and one long pocket to slide in cash or more cards. 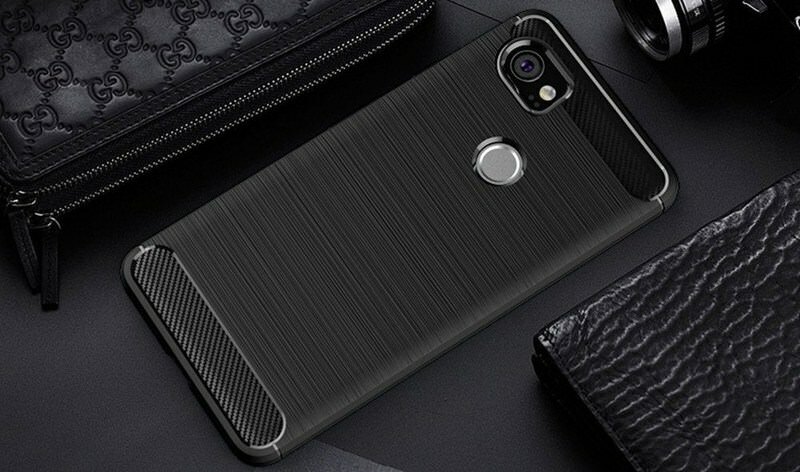 There is a hard polycarbonate case inside that cradles the phone and PU leather covering protects the phone from all the side. The hard shell has precise cutouts for ports and buttons, and its front side is raised to further protect the screen. 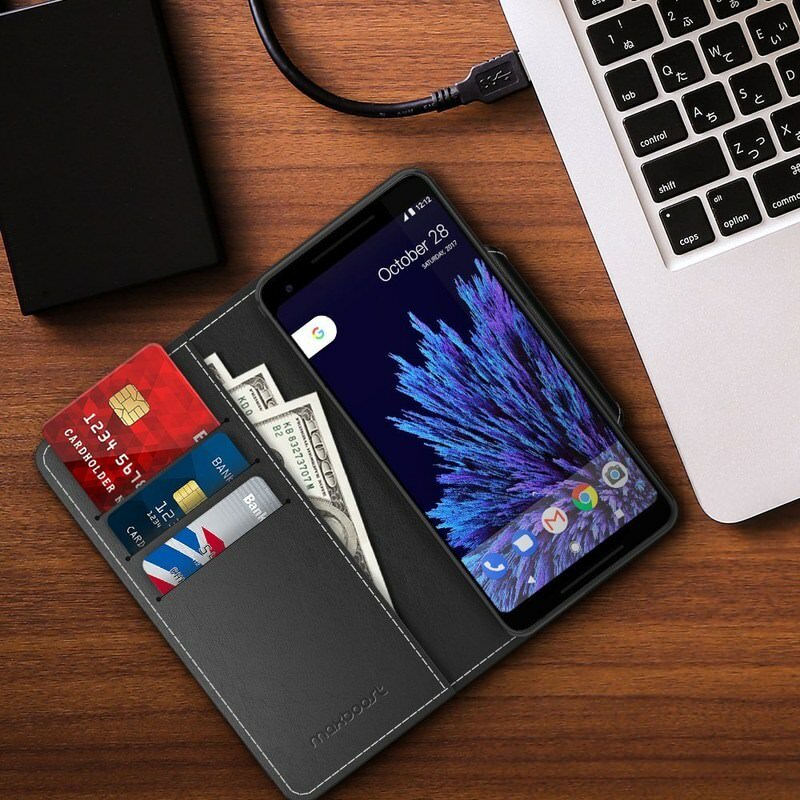 Overall, if you love wallet cases then this is probably the best you can get at a very convincing price. When it comes to protection, it’s one of the most sturdy cases you can buy for your Pixel 2 XL. It’s a very bulky case that will surely protect your phone from hard falls and regular wear and tear. The case shell is made of hard polycarbonate with rubber protection on the sides to absorb shocks. The case fully covers the phone from all the sides and has raised front edges. Although most Otterbox Defender cases come with a dedicated screen cover, but this one is screenless to keep Pixel 2 XL edge-to-edge screen in view. 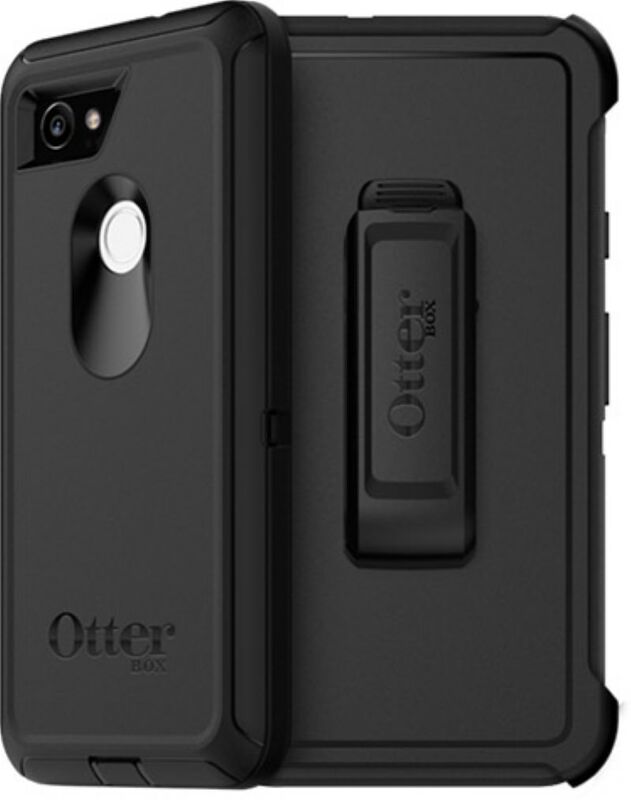 The case also passes Otterbox 238 hours of strict testing consisting of 24+ durability tests. 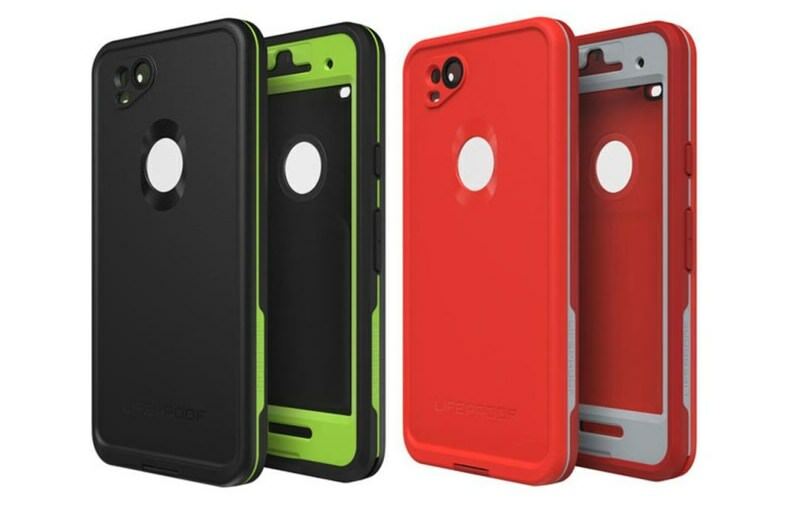 Otterbox Defender Series Pixel 2 XL Case is available for 59.95 USD from Otterbox website. It may be a little expensive, but it’s worth the protection it offers. 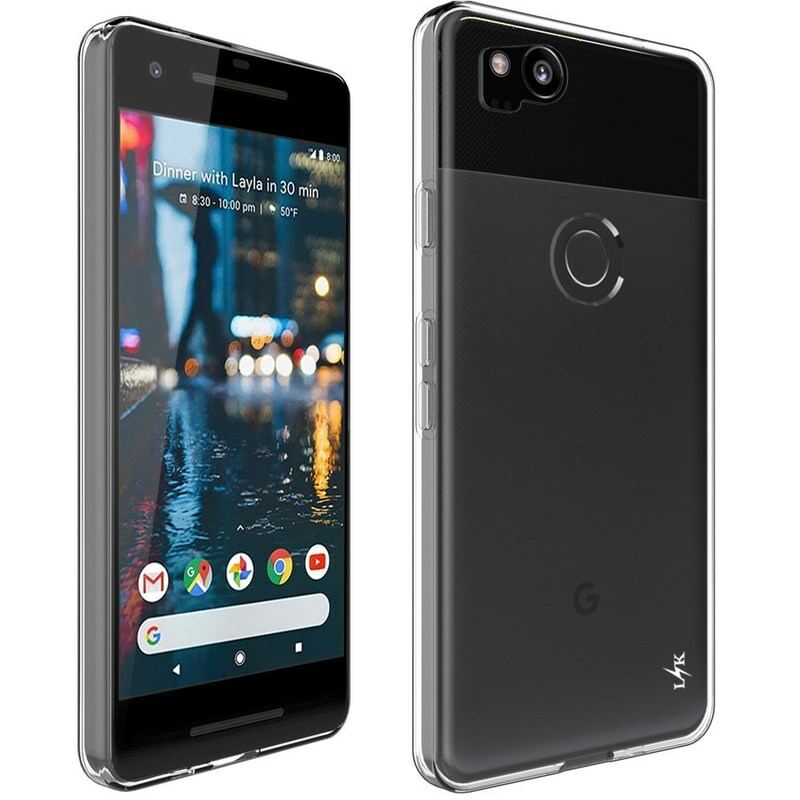 Google Pixel 2 XL is already water resistant, so I will only recommend you get this case if you have to stay near water for a considerable time. It’s an IP68 rated waterproof case that can stay under 2-meter depth for an hour without a problem. This combined with Google Pixel 2 XL’s own water resistance, you’ll get the ultimate protection against water damage. The case is not just waterproof, it’s also very sturdy with military standard protection full cover from the front, back, and the sides. 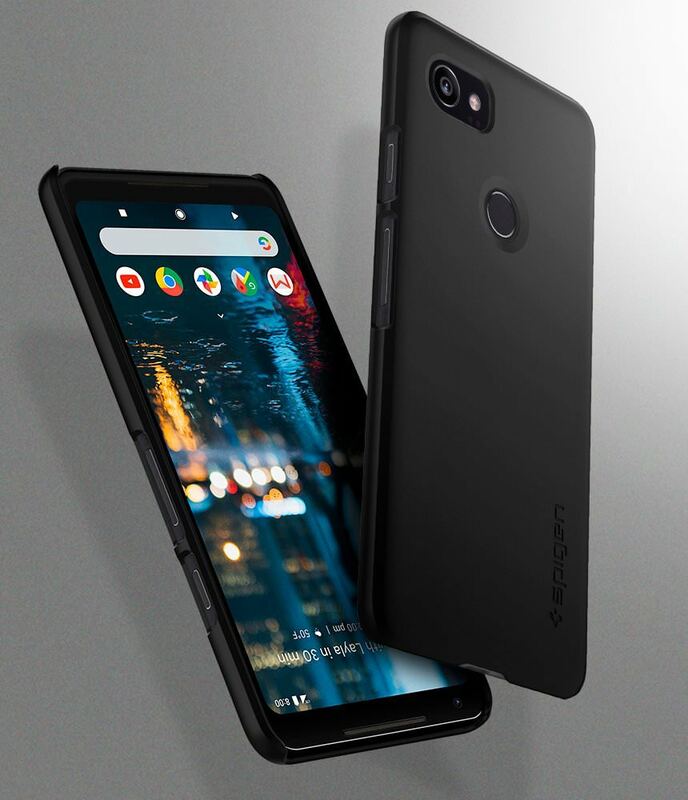 The case is rather bulky and will surely hide your Pixel 2 XL completely, so you better make sure the protection is worth losing the style. It might also be a bit cumbersome to remove protection covers on ports every time you need to use them. 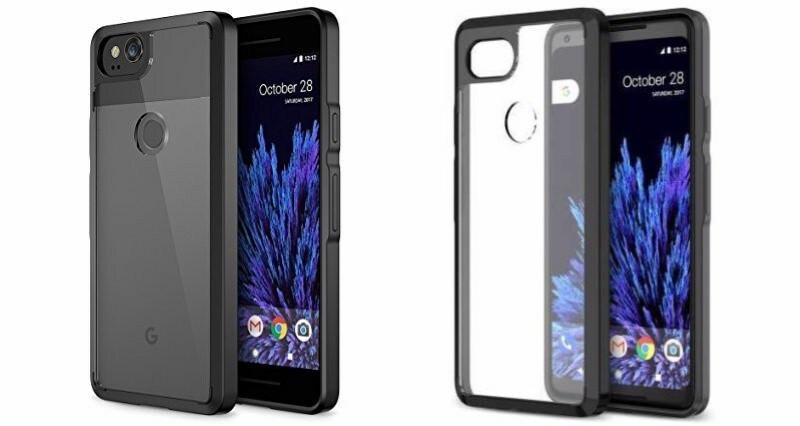 You can buy FRÃÂ Google Pixel 2 XL Case for 89.99 USD from the Lifeproof website. Although leather cases are usually quite expensive, but this one comes at an affordable price. It’s a very minimal case that will hardly add any weight or density to your Pixel 2 XL. Both the inner and outer sides are covered with soft PU leather that gives it an exquisite look. It doesn’t offer much reliable protection as compared to others, but the hard shell inside the leather should be able to sustain minor drops. The big downfall to this case is that it doesn’t have any cutouts or indication for buttons. You’ll have to remember the place of volume and power button to be able to use them. This vintage case is available at Amazon , and there are 3 beautiful colors to choose from. It’s a transparent case for Google Pixel 2 XL that offers great protection. The case comes in a clear transparent version and a smokey faded one. Both versions have beautiful check pattern that really makes your phone stand out. The case is made of Tech21 patented Flexshock™ material that uses 3 different materials to absorb shocks and prevent them from reaching the phone. Thanks to Flexshock™, the case is also very slim and lightweight. Transparent case lovers will surely love this case for its durability and style. You can buy Tech21 Evo Check case right from the Tech21 website for a price of 44.95 USD. 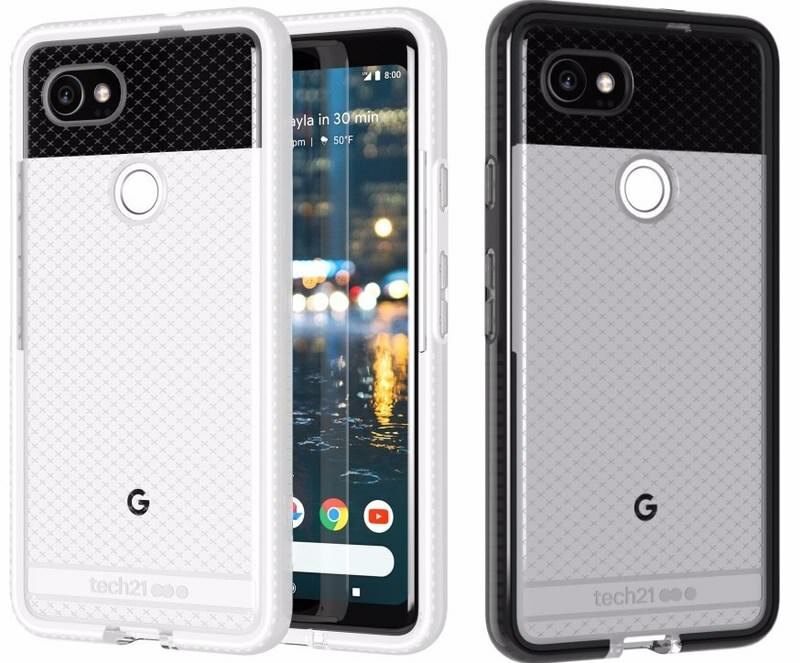 Another clear case for Google Pixel 2 XL case similar to Tech21 Evo Check, but it comes at a much cheaper price. 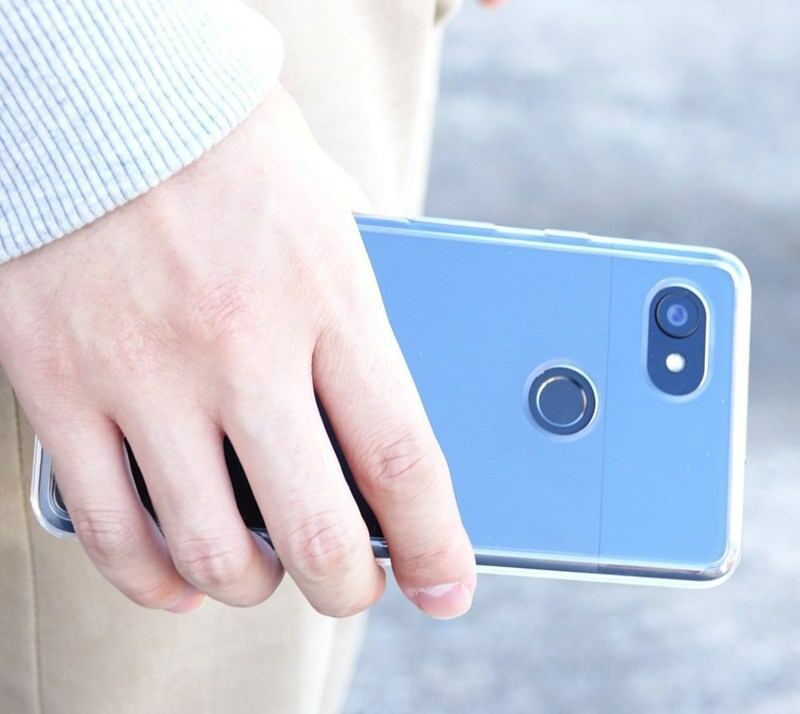 It has a hard polycarbonate back that really enhances its already transparent design, and the sides are protected by shock absorbing clear TPU material. Ringke also claims that the case passes MIL-STD 810G – 516.6 tests for drop protection, so the case should have no problem dealing with regular drops. The four corners of the case are also extra covered to prevent damage, and the raised front protects the screen. This minimal transparent case is also available in rose gold and smokey black colors. The cheapest case on this list that should work fine for most users. If you want style and reliable protection on a budget, then give Dretal Carbon Fiber case a try. It’s a flexible case with TPU and carbon fiber build that will surely protect your phone from 3-4 ft drops and daily wear and tear. The case has three different textures on the back that really makes it beautiful and also help grip the phone firmly. The front lip of the case is also raised a bit which should protect the screen from directly touching any plain surface. You can get Dretal Carbon Fiber from Amazon available in 5 different colors. 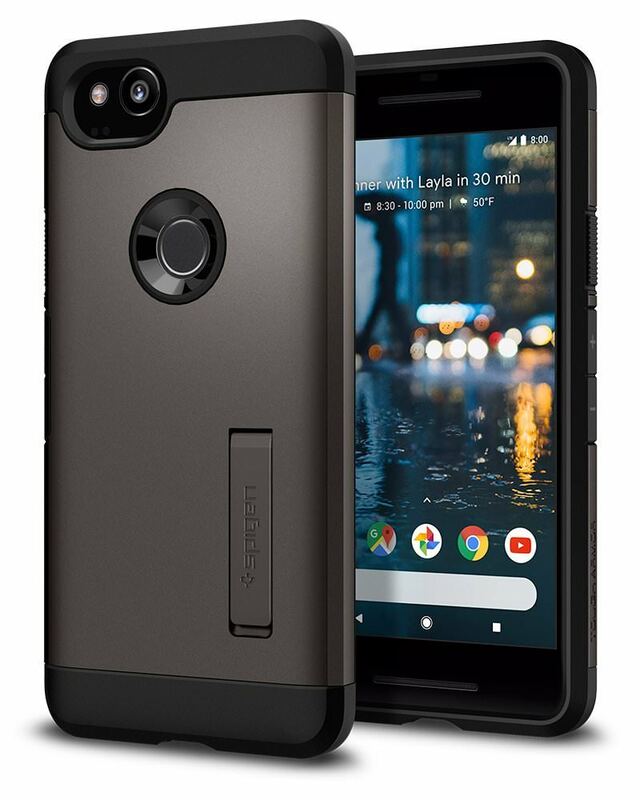 I personally like Speck Presidio Grip case for Google Pixel 2 and Ringke Fusion for Google Pixel 2 XL. Most of the above cases offer reliable protection against routine wear and tear while still adding more style to your phone. Although if you like to venture out often, then a bulky design should not stop you from buying a protective case – like the one from Otterbox. Do share with us which one of these cases you’ll be buying for your new Pixel phone.